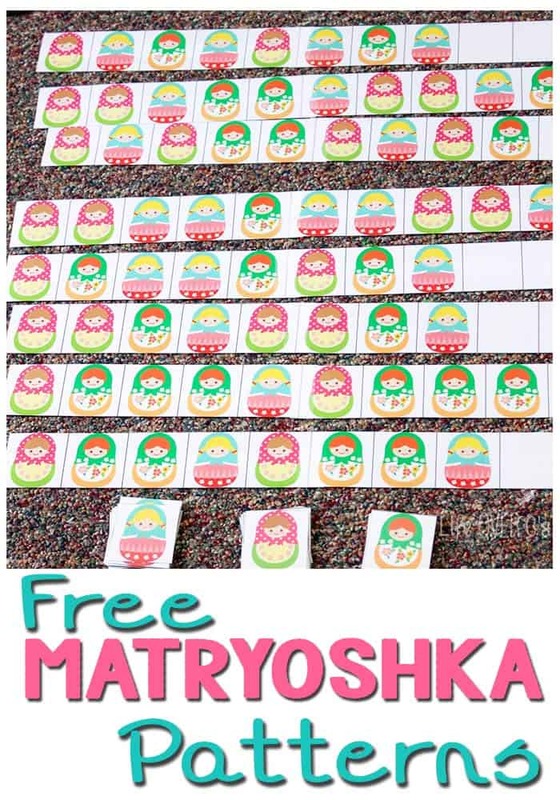 I wanted to add to our pattern collection, so I created these free matryoshka pattern strips to share with you! 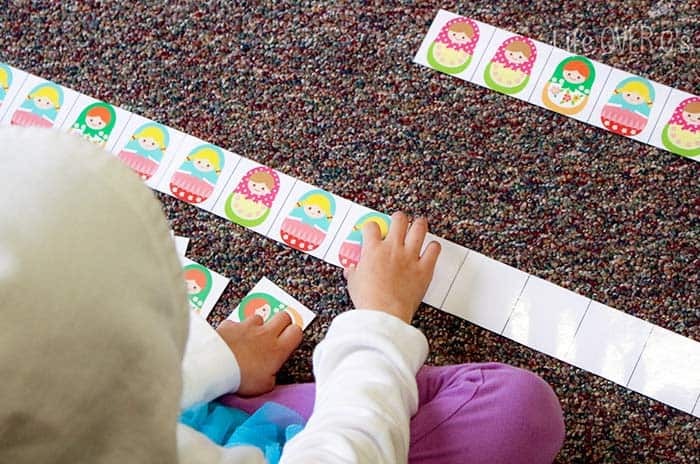 We love making patterns, as you can tell by the many pattern activities that I’ve shared. No matter their age, kids always need practice with patterns. 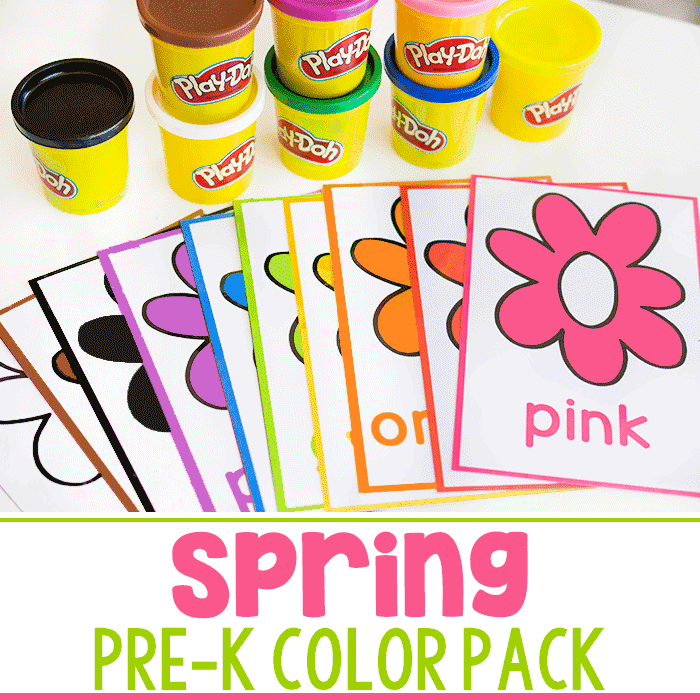 It helps to strengthen their critical thinking skills and leads to better math comprehension. 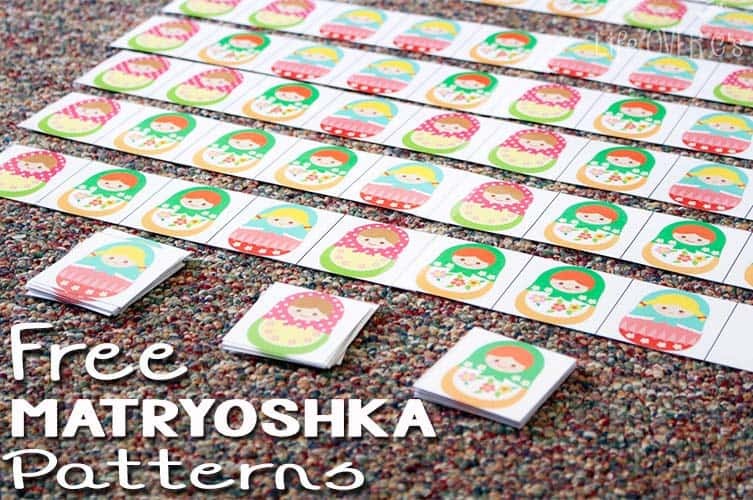 So these matryoshka patterns will get lots of use! There are detailed instructions on how to put the pattern strips together in the file, but below the picture are the general instructions. Here’s one of the patterns (there are a total of ten.) Cut them out on the dotted lines, which means you will have 3 strips of paper. Tape the ‘tape here’ tab of the first section underneath the first apple on the second section. Then repeat to add the third piece. 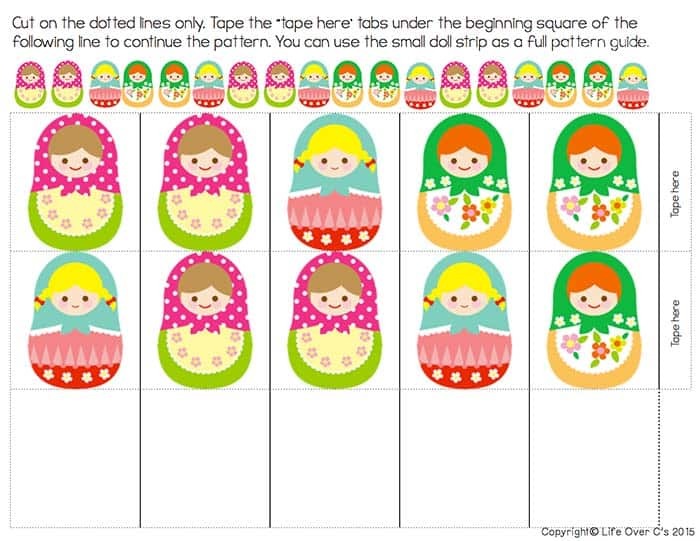 If you want (I did), you can cut out the small matryoshka pattern at the top and tape it to the back of the pattern strip, so that the student can check her work by flipping the pattern strip over when she’s done. To store them, you can put all the strips in a big clip and hang them on the wall, like we did with our free apple pattern strips. 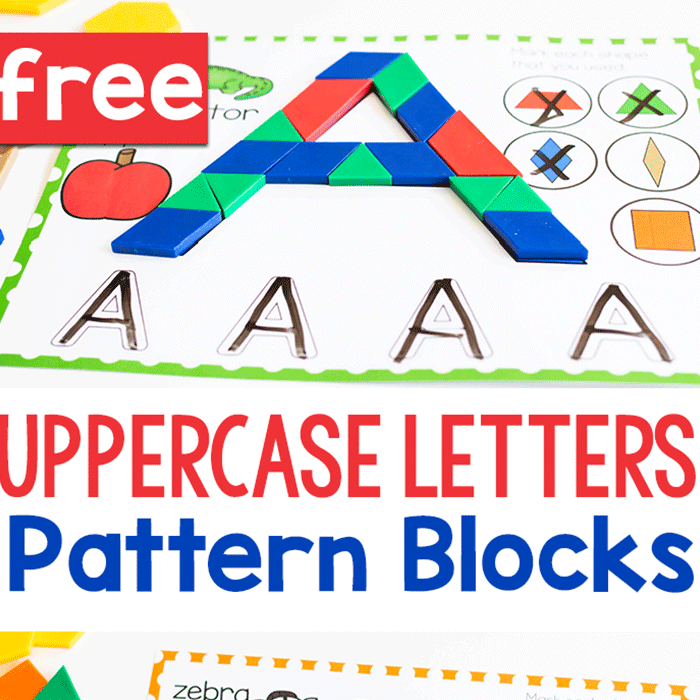 These patterns are longer and more complex than the patterns included in my Pre-k and Kindergarten packs. 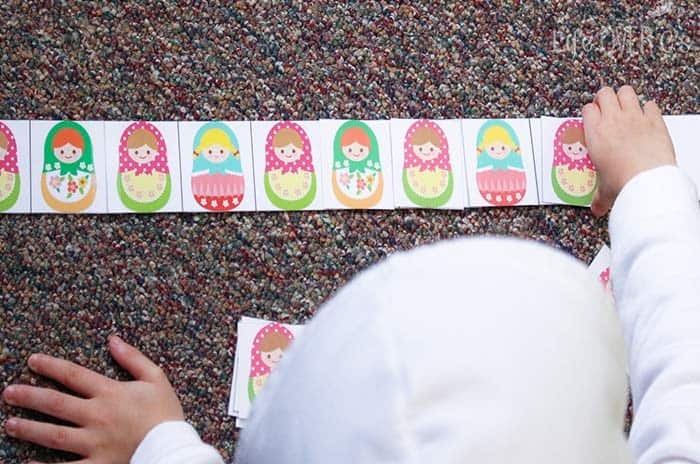 They have 4-6 elements in the pattern to require the kids to think deeper when they are completing them. They were perfect for my 1st grader. She loved playing with the dolls as she put together the patterns. Because they are still a tad bit challenging, we did 3 patterns at a time for a few days. When I used the apple patterns with my, then, 4th grade daughter, she flew through them all as a source of review. 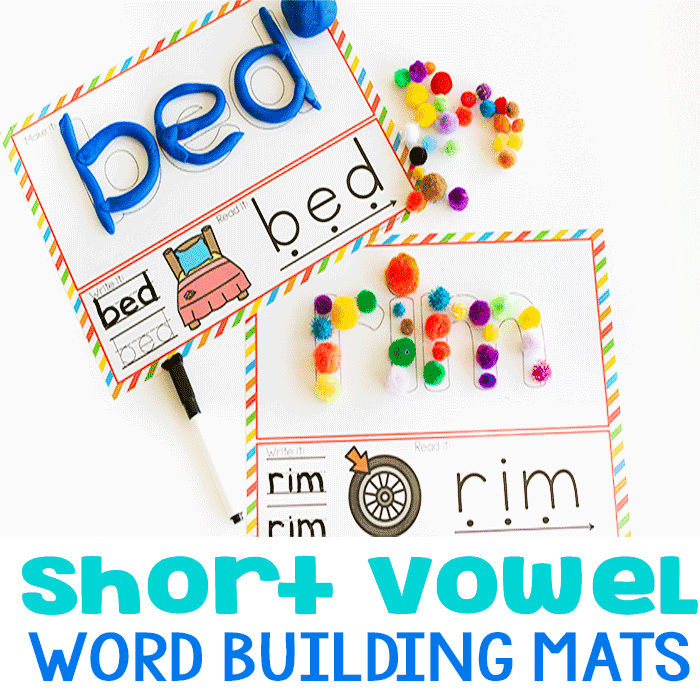 I hope that you and your students enjoy using this as much as we did!